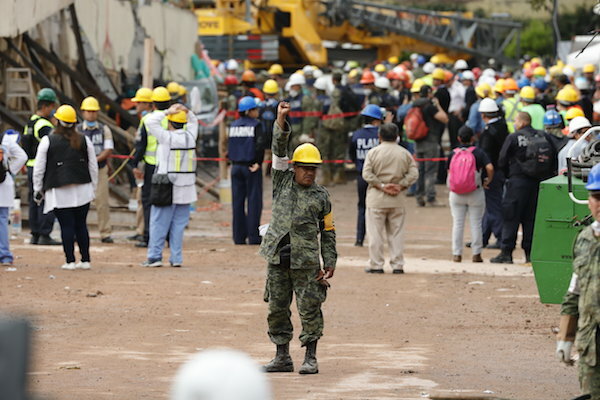 A simple gesture has become the symbol of respect and coordination among Mexican rescuers when it comes to looking for survivors among the rubble left by the fateful earthquake in the capital. Between smoke, stones and debris, groups of rescuers and volunteers working against the clock to save as many lives as possible, have managed to communicate to systematize their work, transforming the gesture of the fist into the air in a symbol of the community facing the disaster. 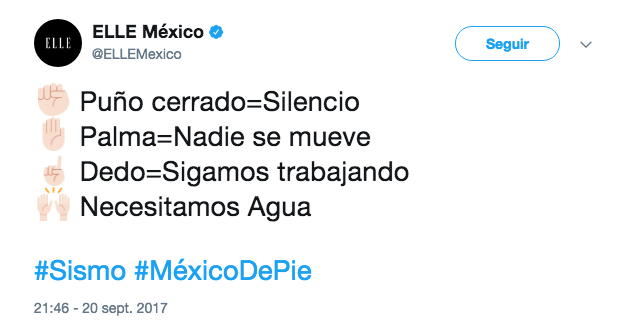 Following the brutal 7.1-magnitude earthquake that has claimed the lives of more than 220 people in Mexico, several experts agree there may still be survivors. That is why communication and teamwork is essential to save so many people who could still be under the rubble. So-called Topos or rescuers have explained to volunteers and activists the importance of silence in the quest to locate any movement or cry for help among the remains of buildings. "When you raise your fist, everyone is silent," said a sailor to the volunteers. The rescuer who works at the Enrique Rébsamen School in Villa Coapa and collaborates by removing debris from the two front buildings that collapsed in the first seconds of the quake, according to Animal Político. "If you raise your fist no one shouts 'silence', nobody does 'shhht', you just remain silent," continued the expert. For all those who collaborate without rest in the streets, the fist in the air "is the most anticipated signal", because it implies a "request for silence" that a volunteer indicates when he thinks he perceives voices or something that indicates there may be someone alive under the remains. Also, other gestures have become law among the workers: the palm of the hand in the air is the request so that "nobody moves" and the gesture of a finger indicating to the sky is understood like "we continue working". The Mexican community has faced such a devastating situation with an unwavering spirit of humanity, will and collaboration. Human chains move remains in a coordinated way when they hear a "Come on, Mexico!" That gives hope to thousands of people who rebuild their country one stone at a time.